Carrie Ritsert is life long resident of Kentucky, born and raised in Shelby County and has since spent most of her adult life in Eastern Jefferson County. She also spent time in Texas and graduated from St. Mary's University of San Antonio, Texas, School of Law. Carrie has worked in the small firm, general practice, atmosphere her entire career. 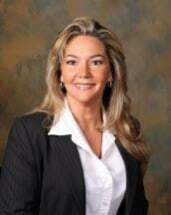 She enjoys serving her clients personally giving them the individual attention they deserve in the areas ranging from Estate Administration, Family/Divorce Law, Bankruptcy, & Personal Injury; with other areas upon request.